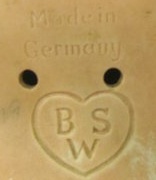 Bruno Schmidt's marking at right; BSW inside a heart, also with Bahr Proschild's crossed swords, plus two sets of mold numbers; the three digit 425, 426 & 500 numbers from Bahr & Proschild and the four digit number 2000 from Bruno Schmidt. 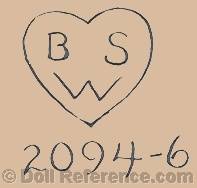 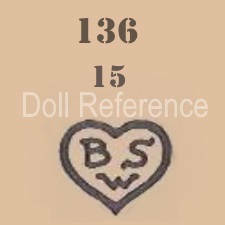 Bruno Schmidt is probably best known for the Tommy Tucker doll molds 2048, 2084, 2096 and the Wendy doll mold 2033. 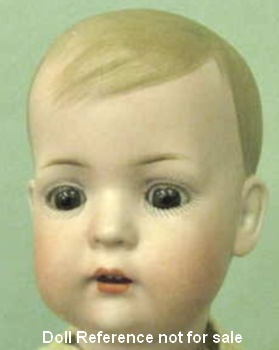 Shown above; Bruno Schmidt Tommy Tucker doll mold 2048, bisque head, finely painted hair, feathered brows, painted upper & lower eyelashes, sleep eyes, open mouth with upper teeth, composition jointed body. 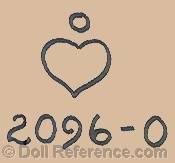 Bruno Schmidt's Oriental doll is doll mold 500. 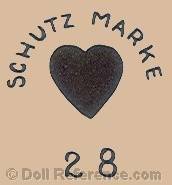 Bruno Schmidt also made celluloid dolls and bisque half dolls at the Bahr & Proschild factory.